Concerns over safe return of UAE pilots causes Abu Dhabi to scale back war on ISIS, question US ability to rescue downed airmen. The United Arab Emirates withdrew from air strike missions against the Islamic State group in Syria after the capture of a Jordanian pilot, who has since been murdered by the jihadists, US officials said Wednesday. The UAE pulled out of the flights soon after the pilot fell into ISIS hands in December, a US official told AFP. "I can confirm that UAE suspended air strikes shortly after the Jordanian pilot's plane went down," the official said. "But let me be clear that UAE continues to be an important and valuable partner that is contributing to the coalition," said the official, who spoke on condition of anonymity. The UAE provides access to important air bases for American aircraft and provides other support for the coalition effort, the official said. UAE's move was first reported by the New York Times. ISIS extremists posted a grisly video Tuesday showing the Jordanian airman, Maaz al-Kassasbeh, being burned alive. Fearing for the safety of its air crews, the UAE raised concerns to Washington about its search-and-rescue resources in the region, officials said. UAE representatives proposed that American forces deploy their V-22 Osprey tilt-rotor aircraft to northern Iraq to be closer to any planes that go down, instead of in Kuwait. The UAE has indicated that the suspension of its participation in the air campaign would continue until the Osprey aircraft were moved to northern Iraq, according to the Times. The Ospreys are considered useful for rescue missions as they can take off like helicopters but fly with the speed of a plane. The Jordanian pilot was reportedly seized by ISIS jihadists within minutes of his jet crashing near Raqqa, Syria. But UAE officials questioned whether US rescue teams would have been able to reach the pilot even if there had been more time, administration officials told the Times. 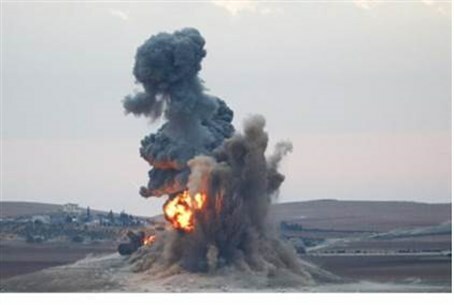 The UAE foreign minister, Sheikh Abdullah bin Zayed bin Sultan Al Nahyan, asked Barbara Leaf, the US ambassador, why the United States had not put more resources in northern Iraq for rescuing downed pilots, a senior administration official said, according to the Times. But a US defense official said that American pilots face the same risks as coalition pilots from the UAE or elsewhere. "When American pilots fly over enemy territory, they know there are risks involved, but they also know they are backed by an unswerving commitment to recover them if they go down," the defense official said. A rescue mission to save al-Kassasbeh failed in January. "There is no risk coalition airmen are taking that American airmen don't share. We do not discuss specifics on the locations of personnel recovery forces or the procedures they follow," the official added. As for stationing aircraft in northern Iraq instead of Kuwait, the official said: "There are considerations other than flying distance associated with where we bed down aircraft, including the personnel and logistics needed to sustain operations." "We continue to evaluate our basing arrangements and will make adjustments as needed." The UAE declined to comment. "We cannot comment on issues discussed in private meetings," an official source said in Abu Dhabi after the New York Times report.